Southeast Missourian file Peyton Hayes competes during the Special Olympics track and field meet April 1, 2017, at the Southeast Missouri State University Student Recreation Center in Cape Girardeau. CAPE GIRARDEAU, Mo. 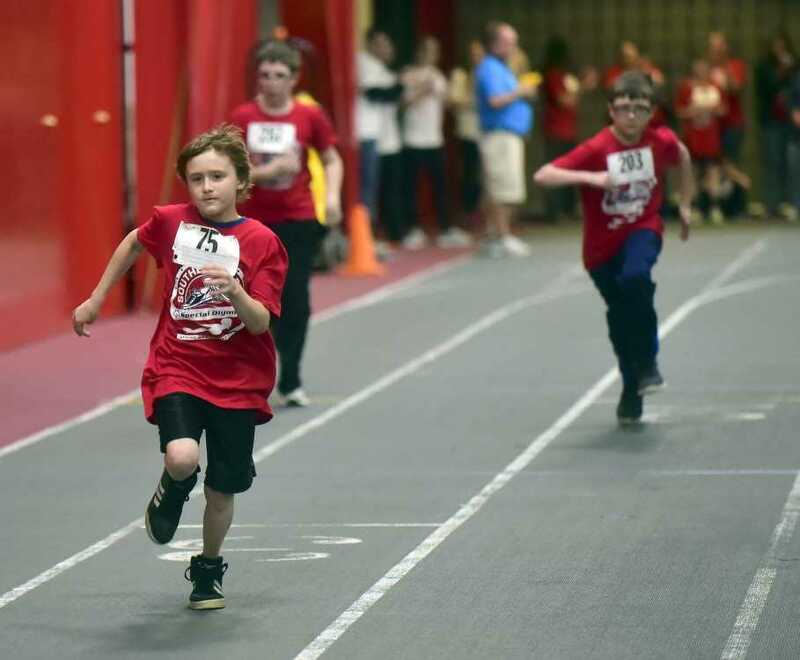 — More than 300 athletes will compete Saturday in a Southeast Area Special Olympics Track and Field Meet. It will be the 28th year for the athletes to compete in the meet, which begins around 9:45 a.m., with the opening ceremony at the student recreation center at Southeast Missouri State University. Event organizer Penny Williams, of the Cape Girardeau Parks and Recreation Department, said athletes will come from 14 counties, from just south of St. Louis all the way down to the Bootheel. Williams said most of the events will be the same as those held at a regular high school track meet, but the meet will have some special events, such as wheelchair races. Athletes train for at least eight weeks before the event and are matched with athletes of similar abilities to create a competitive atmosphere for athletes not able to compete in traditional sports. The event will also have an “Olympic Village” section where athletes will be able to play games and socialize. Greek students at Southeast Missouri State University provide many of the volunteers to put on the meet, though Williams said additional volunteers are desired. She said sometimes the best volunteers are those who are not given specific event tasks but are paired with an athlete to make sure he or she gets around to the events on time and has a good experience between the events. Williams said the organization is running strong in Southeast Missouri with more and more participation. Cape Girardeau has hosted statewide Special Olympics events in the past. Williams said she hopes to draw them back to Cape Girardeau in the future. The Special Olympics track and field meet is supported by the Cape Girardeau Parks and Recreation Department, River Radio, Cape Girardeau Walmart, the Noon Optimist Club, Kiwanis Club, Drury Southwest, Southeast Missouri State University Greek students and Procter & Gamble. The police department also helps the athletes with the torch run, and helps welcome the athletes.